Sainted Theodore (Feodor), Archbishop of Rostov, in the world John, was the son of Stefan (brother by birth of the Monk Sergei of Radonezh), who occupied an important post under the Radonezh prince Andrei Ioannovich. Left a widower, Stefan accepted monasticism, and together with his 12 year old son, he went to the monastery to the Monk Sergei, who foreseeing the ascetic life of the lad John, tonsured him with the name Theodore (Feodor) – on the day of memory of the Monk Theodore of the Hairshirt (20 April). And after Theodore's attaining of an appropriate age, he was given blessing for the priestly dignity. Through the blessing of the Monk Sergei, – on the banks of the River Moskva, at the place called Simonovo, – Saint Theodore built a church in honour of the Nativity of the MostHoly Mother of God and founded a monastery. Soon the monastery began to attract a throng of people, and Saint Theodore, having built a cell five versts from the Moscow Kremlin, began ascetically to pursue new tasks. And here disciples gathered around him. The Monk Sergei, visiting this place, blessed the founding of a monastery, and Metropolitan Aleksei blessed the construction of a church in the name of the Uspenie-Dormition of the MostHoly Mother of God at Novoe Simonovo, which also had its foundations laid in 1379. The old Simonov monastery remained the burial place of monks. By his virtuous life and strict asceticism, Saint Theodore became known of in Moscow. The metropolitan Saint Aleksei elevated him to the dignity of hegumen, and Greatprince Dimitrii Donskoy chose him as his father confessor. 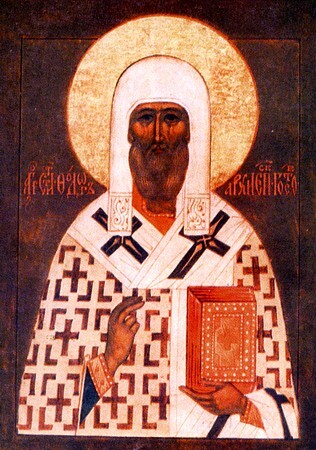 Saint Theodore several times journeyed to Constantinople on matters for the Russian metropolitan. On his first journey, in 1384, he received from Patriarch Nilos the dignity of archimandrite, and the Simonov monastery was put under the Patriarch, thus stavropygial; in 1387 he was ordained archbishop and occupied the Rostov cathedra-seat. Being the hegumen and then the archimandrite of the Simonov monastery, and despite being occupied with general churchly matters, Saint Theodore unremittingly guided monastic life and raised up among his disciples many great and famous ascetics. At the Simonov monastery were tonsured the monks Kirill and Pherapont – the future founders of two famous Belozersk monasteries – the Kirillov and the Pherapontov. It is known also, that Saint Theodore occupied himself with iconography, and he adorned with icons of his own writing both the Simonov monastery, and many a Moscow church. At Rostov, Archbishop Theodore founded the Nativity of the Virgin monastery. The blessed death of the saint occurred on 28 November 1394. His relics are situated in the Rostov Uspenie-Dormition cathedral.